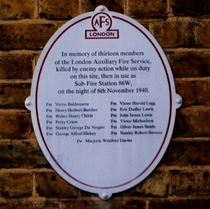 In memory of thirteen members of the London Auxiliary Fire Service killed by enemy action while on duty on this site, then in use as Sub-Fire Station 86W, on the night of 6th November 1940. The plaque is located behind a high exterior wall which makes it difficult to get a sharper photograph. 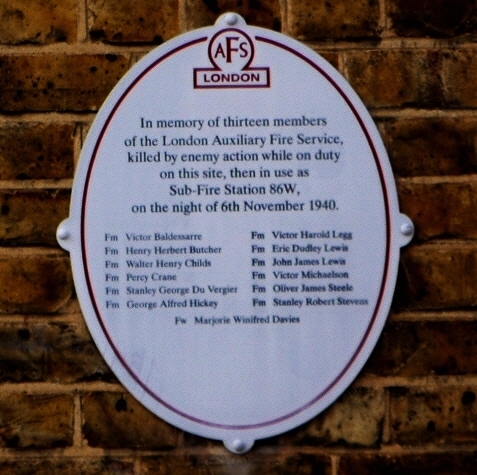 Auxiliary fireman killed in the bomb attack on Henry Cavendish School, Balham. Auxiliary firewoman killed in the bomb attack on Henry Cavendish School, Balham.